If there’s something I am cautious about is getting new credit cards. I have to know that really like the credit card company and it will be the only one I need. I used to be tempted by credit card companies always trying to solicit my business. 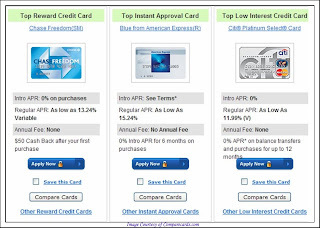 Once I realized that I couldn’t keep up with the many accounts and I really only needed one, I decided to search for the best credit cards online. I wanted one that offers cash back or some sort of rewards for the amount of spending, and one that would have some kind of guarantee with travels. Mostly, I wanted to be able to see the different options I have and what would best match with my life style. I like being able to compare credit cards by its type, such as issuer, brand, gas card, cash back reward, and airline credit cards. One of the options that aroused my curiosity was the ability to compare my current card issuer with the other issuers. I was surprised by the results. I would suggest you take a peak to see what your credit issuer’s rating is. You never know, when you might run into a problem and needed that great customer service experience.